A Traralgon boy has received treatment to improve his quality of life after a wealth of support from Latrobe Valley residents was shown last year. When Jakob Engley was born with an undiagnosed genetic disorder, he was unable to eat, drink, breathe or hear properly. Following a major golf tournament and other fundraisers, three year-old Jakob and his mother Dani McLennan travelled to the United States to undergo intensive therapy. Ms McLennan told The Express Jakob was excited to arrive at the therapy centre each morning for the three-week stint. Jakob underwent speech therapy, physiotherapy and occupational therapy in a NeuroSuit and Cuevas Medek exercises for four hours each day. Ms McLennan, who is an occupational therapist ,said most of the physical treatments involved repetitive weight bearing tasks to instil certain movements into Jakob’s routine. “One of the therapies, called CME, was extremely hard for him and he really did not like it,” Ms McLennan said. 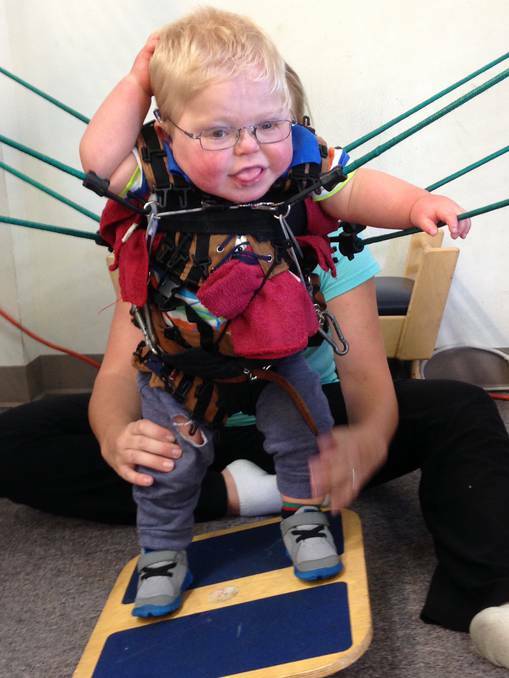 While the exercises were challenging, Ms McLennan said Jakob loved being suspended by bungee cords to jump and walk. “He loved being able to stand independently and move around,” Ms McLennan said. Previously unable to crawl normally, Ms McLennan said Jakob’s new ability to independently transition from a sitting to crawling position and crawling correctly were by far the biggest improvements in his development. “He also gained lots of strength throughout his body,” Ms McLennan said. “Since returning he has started using a sign for “more”, which was a main focus of his speech therapy and just this week he pulled himself into standing for the first time. Currently, CME and NeuroSuit therapy is not offered in Australia and many Australian families travel to the US to undergo treatment. “I believe there are one or two therapists in the country starting to introduce NeuroSuit therapy here but it is very early days,” Ms McLennan said. “The centre we attended has started coming out to Australia a few times a year and we tried desperately to get Jakob a place in these sessions but they were booked out a year in advance, within minutes of the sessions being offered. With the therapy trip costing more than $25,000, Ms McLennan said she was grateful to all who helped make it possible for Jakob. “We have been extremely well supported by our family, friends and the community,” Ms McLennan said.